Following on from last weeks’ EDC post, here is the list of what I take to the Gym. As the great Eddie Izzard said, I have “techno joy!”. This means I tend to take a high-tech approach to motivation and tracking. It prevents me from cheating myself and the program. I also post everything online to prevent laziness. I am new to running. My background is in martial arts and this basically means I have a good grip, good leg power and explosive energy. I rarely needed to go through “the wall” in my past training. Martial arts fights are only 3 minutes in competition and 3 seconds on the street. I will be honest here and say that my skill level has “let me off” a lot of fitness in the past few years (even unfit I could handle all the Goju fighters up to 2nd dan). This is bad! I ended up seriously injured by not being able to “keep up” and consequently getting a foot in my eye. I was once very fit (standing back somersault), but now I have a middle spread. I am on the road but not at the end of this journey. This post is what is working for me. So far. I will post in much more depth when I have reached my goals. What I have learned is that the only person you compete against in this world is really yourself. You may be able to do more, or less, than I – I have a friend who can run faster and further than me for example. However, we can all excel by breaking our times, improving our weight and increasing our strength. 100 pushups, 10k run, 19kg weight loss. RunKeeper to track my times on the run. MyFitnessPal to track my calories (the built-in bardcode scanner is brilliant). 100 Pushups to force me to improve my pushups. PodRunner Intervals to set my pace. Interval training is the best thing in the world for fitness. I read a university paper on how interval training is 9X better than “Steady state cardio”. This software plays music at two tempo’s. When in the lower tempo you walk/jog. When in the higher tempo you run. You never cheat. I find it easier as I focus on the next, closer, down-tempo beeps than trying to run for as long as possible. Each week this gets slightly harder. It’s brilliant. 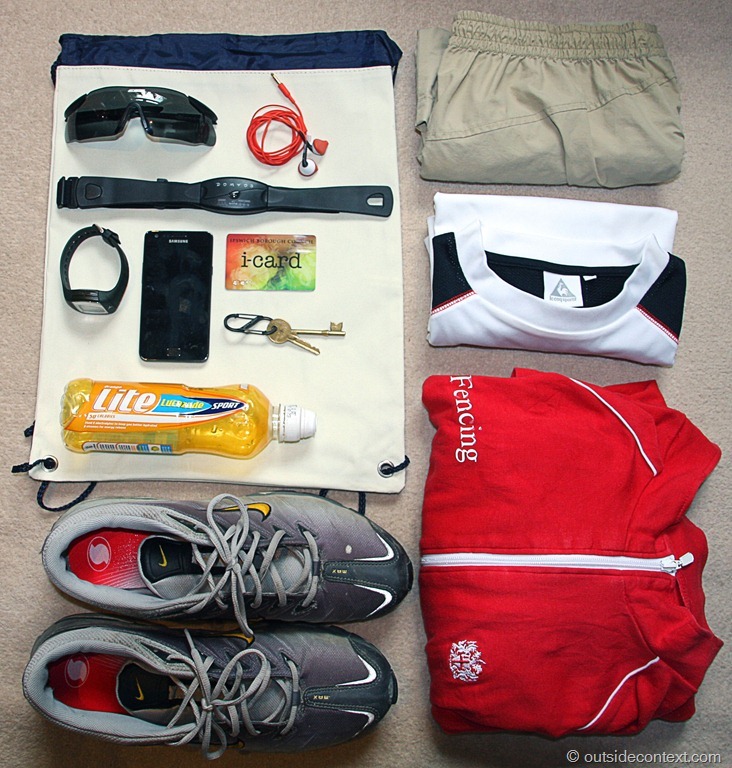 Left to right: Ipswich Gym Bag, ESS Sunnies, Panasonic “gym” headphones (sweat proof), Rohan Shorts, Decathlon Heart Rate Chest Strap, High Tech T-shirt, Decathlon Heart Rate Watch (also counts calories spent – nice and cheap), Samsung Galaxy S2 Android Phone (avec GPS), Gym Swipe Card, Keys, Lucozade Lite Bottle (just filled with water, light enough to run with), City Fencing Club light over-jacket (it’s cold in the mornings and after the gym), Nike Air Max (dug out from the attic), Gel Running Inserts (vital when road/pavement running or you will get shin splints). Missing: Socks. Every other day I get up at 6 am and run to the gym at 7 am. I then train there in the following way and then run back. Calling it “running” is probably going too far. It’s more like “struggling”, but I am improving all the time. On Wednesday afternoon I go to Aikido training (http://www.aikijutsufelixstowe.co.uk/ under master Ragucci) this is not ‘”hard” training (hard like Goju), but of very high quality. When working in London I do an evening set after getting off the train and a morning set on my day working at home. Before gym: “Grenade” fat burner pills x 2 (basically caffeine, green tea and Cayenne pepper) to raise the metabolism. Raising the metabolism is the key to weight loss. That’s why busy people have less fat. It’s a matter of “burning” it by just being around. Once raised the benefits come in the post work out where the body has to work harder to recover. After gym: Protein Shake. There are hundreds of brands, but the important thing is to get some in you 20 minutes after working out. Your muscles are like sponges in this crucial time. Diet: Target 1600 calories a day. One day off per week (pizza!). Drink is low-calorie beer or Gin. Weights note: Weight training is brilliant for burning fat. Also, my gym is basic (no bar) and this is the best I can do here (max weights 35kg). Dumb Bell Press (on back on the bench) – 3×6 @ 25kg (Oh, note that weights are set to your own level. It should be hard to finish the last set). Crunch Abs Frame – 3×10 straight, 3×10 sides (both sides), 3×10 legs raised. I know that the only way to show abs is to lose weight, but what the hell. Finally, the Pushups program (around 60 or so with breaks). Then the shake, shower, breakfast (scrambled eggs) and to work. Note: No caffeine through the day when on the pills. Comments are welcome, as is advice.